The Fool has written over 2700 articles on IBM. 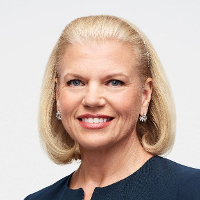 IBM earnings call for the period ending March 31, 2019. Here's what needs to happen for an acceleration to make sense. Big Blue shares pop on a good fourth-quarter report and guidance for 2019. Is IBM Really Resetting the Cloud Landscape With Its Red Hat Acquisition? At $33 billion, the purchase of the Linux and cloud specialist is a major move, and Big Blue really needed one. If you’ve ever wished your barista could just levitate the java straight to you, Big Blue is on your wavelength. Big Blue's fourth quarter showed some financial muscle in the face of difficult currency exchange trends and also supported some solid guidance for the next year. The fourth-quarter earnings report exceeded Wall Street's expectations, and management issued optimistic guidance for the next year as well. Big Blue is buying Red Hat to create a large, purple Linux fedora. The company's turnaround strategy might be too little, too late. Big Blue launched a $34 billion buyout bid over the weekend. After three quarters of growth, Big Blue's revenue started moving in the wrong direction again. Big Blue left investors feeling, well, blue following an unconvincing earnings report. Third-quarter results came in above Wall Street's targets, and management expects a return to earnings growth in the next quarter. IBM earnings call for the period ending December 31, 2018. IBM earnings call for the period ending September 30, 2018. IBM earnings call for the period ending June 30, 2018. IBM earnings call for the period ending March 31, 2018. Industry, sector and description for IBM.